People with an understanding of ASL and Deaf culture are needed in nearly every field to help communicate with Deaf and hard of hearing people and ensure access for everyone. Did you ever think about how you could combine ASL Studies with another area? 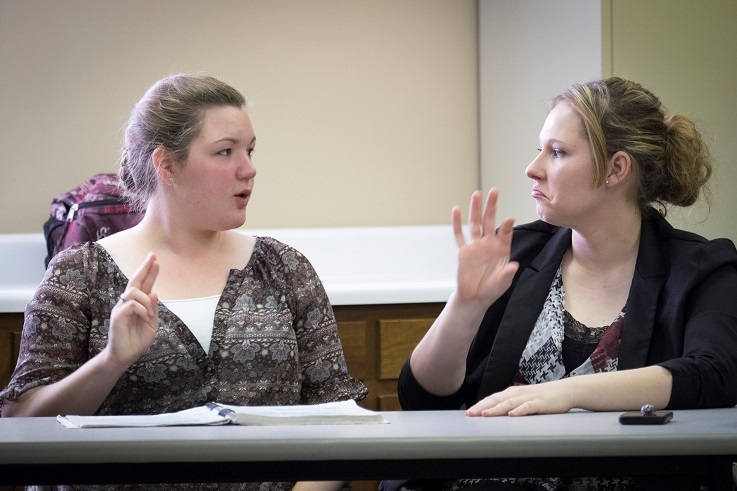 Often, William Woods University ASL interpretation studies and ASL Studies students take on a second major in another field to pursue specializations, such as education, theatre or psychology. These are just a few examples of areas with documented shortages in recent years, and even more specifically, fields with fewer professionals who possess competencies in two specific areas, such as Deaf education and school psychology, said Felicia Castro-Villarreal, associate professor at the University of Texas at San Antonio Department of Educational Psychology in a recent press release. Castro-Villarreal’s program at UTSA was a recent recipient of a $147,000 grant awarded by the U.S. Department of Education’s Office of Special Education Programs to UTSA for its Deaf Education and Educational Psychology (or DEEP) Learning in Texas Project — a five-year graduate program that will be used to train new school psychologists that specialize in Deaf education, as well as teachers of the Deaf in how to apply principles of educational psychology in their work with children. “The DEEP project seeks to address this professional need and also increase teacher quality by preparing teachers of the deaf and school psychologists who will provide effective, high-quality instruction and related services to children who are deaf or hard of hearing and their families,” said Castro-Villarreal. There are also several practice areas for ASL interpreters in which taking courses in those areas may help you sharpen your expertise as well as give you a taste of that world so you can decide if it’s really right for you. Additionally, you can pursue a second bachelor of science degree in Deaf Human Services, a new William Woods University degree program that will be offered to both traditional and online students beginning fall semester of 2018. This degree is designed to meet the shortage of quality employees able to serve the deaf and hard-of-hearing community, a population significantly underserved at the local, state and national level. If you do think there is a specific area you want to focus, or you want to gain some expertise by way of a second major, make sure you talk with your advisor for the best course of action for you. US News & World Report notes a couple of important tips for ensuring a double major is right for you, and developing a game plan — including starting early, mapping it out, and making every class count.